Point-of-care ultrasound is a valuable tool for successful dialysis fistula surgery, allowing pre-operative mapping to find a suitable site and post operative fistula scanning to check for stenosis and adequate blood flow. Anna Jerram, a clinical vascular scientist at the Manchester Royal Infirmary, discusses the role POC ultrasound played during a recent trip to The Gambia to provide critical fistula surgery to patients. "The current hemodialysis provision in The Gambia is limited. The Ida Bass Kidney Foundation (IBKF) was established by Sailey Fladsrud following the death of her mother in 2013, only 11 months after she was diagnosed with chronic kidney failure. Since its inception, the charity has commissioned a 14-bed hemodialysis center in 2015 in The Gambian capital city Banjul, with dialysis machines donated by UK hospitals. In May, an opportunity arose for a four person team from Manchester Royal Infirmary – including two renal transplant surgeons, a vascular access specialist nurse and myself – to travel to the center to carry out fistula surgery at the Edward Francis Small Hospital." "Patient dialysis at the center is mainly carried out using temporary lines, which are prone to infection due to the indwelling catheter. The alternative involves a surgical procedure to create an arteriovenous fistula in the patient’s arm, joining together an artery and a vein to form a high-volume reservoir of blood flow. Dialysis is achieved by inserting inflow and outflow needles, and offers much lower infection rates than catheterisation. Any surgeon performing fistula surgery would be very hesitant to proceed without ultrasound to map the blood vessels and identify suitable fistula sites, which depends on the individual patient’s anatomy and the quality of the vessels themselves. "If there is a suitable site at wrist level, that will be the first port of call as, if a wrist fistula fails or goes wrong, there are still higher sites they can attempt. Ultrasound is then used for post-operative scanning of the fistula to determine that the flow volume is adequate for dialysis – the optimal flow is around 600mL per minute or greater. It is also important to check the diameter and depth of a fistulised vein, to make sure it's not too deep for dialysis. If it is, the needles won't go in properly, and so the surgeon will need to bring the vein closer to the surface." "In Manchester, I use a FUJIFILM SonoSite M-Turbo instrument at the mapping and fistula follow-up clinics; I borrowed one from SonoSite for this trip so I could do the same in The Gambia. With only a week to get through as many patients as possible, we accelerated the process, mapping the patients and performing the surgery within 24 hours. The patient group turned out to be more complex than we anticipated, as a number of them had failed fistulas already. This made it more difficult to find a suitable new site, and ultrasound mapping was especially important in these cases. There were times when we were surprised; a length of the vein was thrombosed, but another branch looked promising, and the consultant was happy to proceed. The fistula procedures we performed had a 100% success rate. "The patients who had the surgery were very grateful, as they would not have been able to afford the operation privately, which is the only other option currently available. Our visit also meant we could provide training to the hospital staff, covering the theory of fistula ultrasound, vein mapping, and fistula creation and aftercare. In future, it would be great to have a two-way programme, and offer a chance for hospital staff to visit Manchester, and we all hope to stay in touch with our new colleagues in The Gambia." 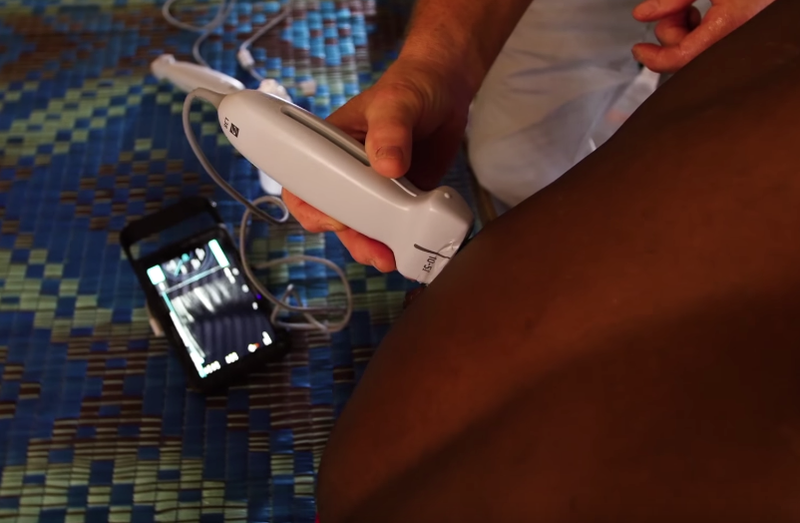 Dr. Engevik brought a SonoSite iViz to The Gambia to show how portable ultrasound systems can be useful in determining if internal injuries, such as internal bleeding, punctured lungs, or ruptured spleens, are present in trauma patients.